Most of this reflective process is done solo by the teacher, collaboratively with teachers on the same unit or with a PYP coordinator. Although this should take place, there is one stakeholder, the most important in all schools, that does not get any input for these sections of the reflective process – the students! Teachers and coordinators should make room for students step in the reflective process on the PYP planner. They should involve the very people they planned the unit for! Why don’t teachers ask the set reflective questions with their students? With support (and modifications for age and language), students should be able to answer all of the questions. Section 6 – student understanding of the Central Idea…. Students should be able to give feedback on how you designed assessment tasks. They should actually be architects of the assessment tasks. Therefore, they should be given to reflect on their effectiveness. Students should be able to give evidence of how they showed an understanding of the Central Idea. After all, isn’t this the purpose of a summative task? Students should be able to draw links between the Central Idea and the Transdisciplinary Theme. This allows the teacher to see if students actually have an understanding of the Transdisciplinary Theme they are inquiring into. This would allow students to see how their Unit of Inquiry is linked to a larger picture. It would push teachers to actually ‘unpack’ the Transdisciplinary Theme. Students should be able to identify the Key Concepts, Approaches to Learning, Learner Profile attributes and Attitudes from the unit and cite evidence of their development with these PYP elements. Teachers should be making these PYP elements explicit in their daily teaching. Students should see what PYP elements they are trying to improve. Students should have a large voice in this part. They would be able to tell you what worked for them and what you need to improve as an teacher. All this would require teachers to be open minded and open to criticism. However, this would be a valuable and crucial method of reflection. 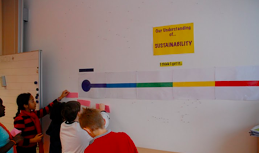 Providing students with opportunities to have their voice present on PYP planners would give a true reflection on the learning that actually took place. It would make these sections of the planner more authentic. It would also reduce the subjective view a teacher could make. It is time to put planners in the hands (or minds) of our students! It is time to put students in the centre of the reflective process!